Missy will warmly welcome and assist you. When you come to our office, you are not just a number or a customer. You are a person and our priority. One-on-one service is our specialty. From the moment you schedule an appointment, to her friendly greeting upon your arrival, Missy will make you feel welcomed and cared about. With professionalism and care, Missy will make sure you receive help with prompt service. You will receive personalized, conscientious service and attention. Missy works hard to help people at all times- especially during emergency situations. If you ever have an eye emergency, she will come to your rescue and let the doctor know. (If you have an emergency after business hours, call 712-225-3693 anytime to learn how to receive help.) Missy will make sure your experience at the office is a positive one. In a kind, patient way, Konnie will assist you as you select and adjust to fantastic contact lenses! At Willow Street Optics, thorough eye care and prompt service are important priorities offered to every patient. Konnie is knowledgeable, helpful, and caring. She checks visual fields, helps you with your contacts, and adjusts your glasses. 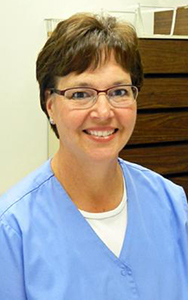 With experience, she understands our large inventory of prescription contact lenses and can provide our patients with the ability to replace contacts quickly and easily. If you lose a contact lens, Konnie will come to your aid. 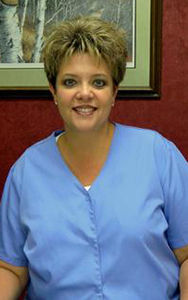 When you visit our office, ask Konnie about the best ways to care for your contact lenses. Konnie offers each patient individualized attention. Her expertise also includes insurance, Medicaid, and Medicare filings. Konnie makes sure every patient receives prompt, personalized, and affordable service. Twyla will help you look your best! One reason why our office is known for offering exceptional eyewear is thanks to its especially large eyewear dispensary. Come see the large selection of eyeglasses, sunglasses, eye glass cleaners, and eyewear accessories. Twyla is our frame expert. She will aid you in your frame selection to make you look your best and guide you concerning any type of frames you wish to select. She knows how to serve you best for your eyewear needs. Twyla will measure and order your eyewear. Plus, she will provide you with free eyewear adjustments and repairs. 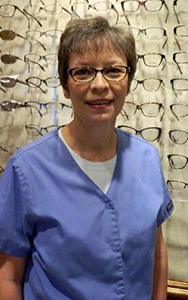 Twyla will answer your questions about lenses, frames, safety glasses, sunglasses, and the latest in eye care products. (Ask Twyla about Fitovers if you already have prescription eyeglasses but would like sunglasses, too.) Most importantly, Twyla will help you maintain a look or create a “new look” for you so that you can look your ultimate best.